For the United States, it’s nice to have the rest of the world respect us but failing that, it’s important for the stability of the globe at large to have them fear us. The current complete disintegration of the situation in Gaza is demonstrating nicely that they do neither anymore. Blaring headlines across the global news sphere are now announcing that the 72-hour ceasefire, negotiated by the very obviously out of his depth John Kerry after a solid week of bumbling and public embarrassments, has dissolved after 90 minutes. Libya and Iraq are now either in flames or are under the control of militant Islamists who are destroying U.S. interests with impunity, or both. Russia is slow playing an out-and-out reconstitution of the former Soviet Union while shooting civilian passenger jets out of the sky. The “occupied territories” of Judea and Samaria and Gaza were under Jordanian and Egyptian rule, respectively, from 1948 to 1967. Why did the Palestinians never complain about “occupation” or clamor for a state during that period? When Israel withdrew from Gaza we were promised that Gaza would be a place where the Palestinians could live freely and peacefully. Instead, it became another jihad base. A Palestinian state will too, since they have never recognized Israel. Just weeks after Mahmoud Abbas, leader of the annihilationist movement in Israel, against Israel, said, “We will never recognize Israel as a Jewish state,” yet again ratcheting up the threats and the hate. Even the leftist tools exploited by Islamic jihad can see it is what it is. Considering how blinded they are by their own delusion, this is pretty remarkable. This is the real “freedom flotilla.” We call on all free nations, free peoples, to support the Freedom from Jihad flotilla with boats, ships, funding, security and will. There should be a navy of Freedom from Jihad flotillas. The Hamas flotilla is an act of war and should be condemned internationally. Is it any surprise that the Ground Zero mosque radical imam Rauf was a prominent member of the organization that financed the first jihad flotilla? AP -Christians in Egypt increasingly live in fear of discrimination and persecution, and political change may not be a change for the better. Some Christian demonstrators were seen praying peacefully with Muslims, as protests gripped Tahrir Square in Cairo. But with an uprising in the streets and upheaval in the government, Egypt’s Christians, who make up about 10 percent of the population, aren’t likely to end up with someone in power as tolerant of them as even President Hosni Mubarak has been. The Muslim Brotherhood is a radical Islamic group that in recent years has tried to tone down its extreme image in search of a greater role in the Egyptian social and political structure, but some argue that the group never really shed its extremist past. AP-2010 – Dec. 20: Former British Prime Minister and International Mideast envoy Tony Blair, left, meets with Palestinian President Mahmoud Abbas, in Ramallah. A cable released by WikiLeaks on Dec. 20 suggested close cooperation between Israel and forces loyal to Palestinian President Mahmoud Abbas when rival Hamas militants overran the Gaza Strip three years ago. JERUSALEM — A cable released by WikiLeaks on Monday suggested close cooperation between Israel and forces loyal to Palestinian President Mahmoud Abbas when rival Hamas militants overran the Gaza Strip three years ago. The disclosure could embarrass Abbas and his Fatah movement, which Hamas has accused of working with the Israelis. Abbas’ standing among Palestinians has already been weakened by his failure to make progress in peacemaking with Israel. The June 13, 2007, cable from the U.S. Embassy in Tel Aviv, citing a conversation that took place during the civil war that ended with Hamas’ takeover of Gaza, cites Israeli Security Agency chief Yuval Diskin as saying Israel had “established a very good working relationship” with two branches of the Palestinian security service. Palestinians have a complex relationship with Israel, pursuing peace talks on the one hand but considering it an enemy on the other, because of its occupation of the West Bank and its settlements there. Collaboration with Israeli security is seen by Palestinians as an onerous offense. After the Israeli action against the Turkish jihad flotilla aroused more international condemnation of Israel, Iran is now sending two of its own Islamic jihad flotillas – Moetillas – to Gaza. The war ship convoy (which the media affectionately has called a “humanitarian flotilla” while the “aid workers” set out to slice and dice the Jews) operated by jihad gangs from thug countries is the new way to wage war in the twenty-first century, if you’re not already busy blowing up buildings, trains, planes and other civilian targets. The jihad flotilla. It melds propaganda together with violence, usually conducted separately, to wage war. The “aid ship” is the face of this century’s warship, like lipstick on a pig. Of course, all of this is possible because the world media is aligned with the terror force. So when the jihadists, with the help of their leftist whores, paint up their weapon-filled warships like $2 homicidal trollops and call them “aid ships,” the media laps it up like a dog returning to its vomit. 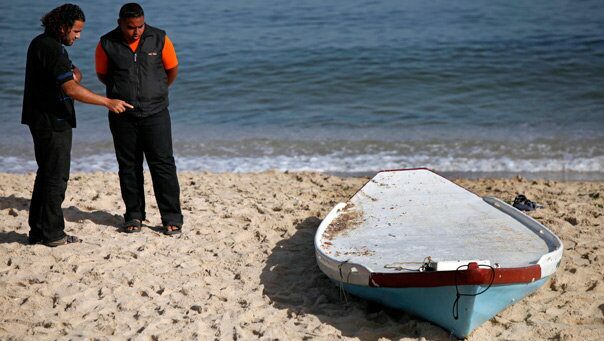 AP – June 7: Palestinians look at a boat used by Palestinian militants after they were killed by Israeli forces off the coast of Gaza. JERUSALEM — Israeli naval forces shot and killed four men wearing wet suits in the waters off the coast of Gaza Monday, and a militant group said they were members of its marine unit training for a mission. The attack was the latest escalation in tensions over the 3-year-old blockade of Gaza. It came a week after Israel raided a Gaza-bound flotilla carrying humanitarian supplies and hundreds of activists protesting the closure of the Hamas-ruled Palestinian territory. Israeli soldiers killed nine activists in a clash on one of the flotilla boats, bringing fierce international condemnation and new pressure to ease the blockade. Vice President Joe Biden said Monday the U.S. is closely consulting with Egypt and other allies to find new ways to “address the humanitarian, economic, security, and political aspects of the situation in Gaza.” He spoke in the Egyptian Red Sea resort of Sharm El-Sheikh after meeting Egyptian President Hosni Mubarak. There’s something soooooo familiar about this. Now here is the same picture as first released by Reuters. Notice that they cropped out the the terrorist’s knife?